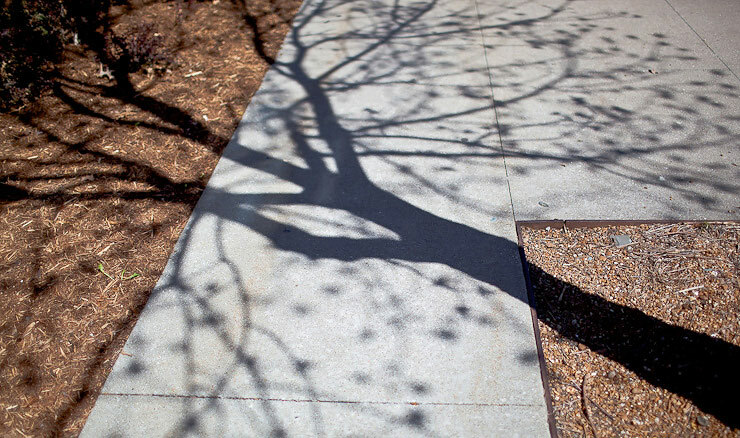 Shadows on the sidewalk, Columbia, Mo. | Canon 5D Mk. II and 35mm f/1.4L lens; exposed 1/8000 sec. @ f/1.6, ISO 100. Aperture Priority set at 0 EV. One of the issues that I have noticed before when using large-aperture lenses in broad daylight is that the perfect exposure can be difficult to achieve wide open. While many of the people in the photo sequence at the Missouri School of Journalism set exposure manually, I have preferred working with aperture priority–coupled with evaluative (matrix) metering–for many years now. It does require that you develop an idea of what the exposure for the scene should be relative to a “neutral” setting. Generally, for outdoor photography, a neutral exposure on a sunny day (plus or minus one third of a stop) will yield an optimal histogram. Because I work in Aperture Priority, I am concerned more with the set aperture (preferably f/1.4 with this lens) and ISO. This works well, unless the lighting conditions make the desired exposure compensation impossible with the selected aperture and ISO. Today, I was keeping the ISO set to 100 because it was a bright, sunny day, and my shutter speeds were well above 1/1000 second. Because of this, the importance of safety shift comes into play. When this custom function is activated (C.Fn. I-6 on the 5D Mk. II) when the desired aperture and ISO would not yield the exposure compensation selected (in this case, neutral), the aperture is changed automatically to ensure that the exposure comp. set is the exposure that is yielded. In the instance of the above photograph, the camera automatically switched the aperture to f/1.6 (a slight stopping down) because the shutter speed could not be any faster at the camera’s max. shutter speed of 1/8000 sec. Note that while I am referring specifically to a Canon custom function, Nikon bodies have a similar feature. Furthermore, the more professional bodies, such as the Nikon D3 and Canon 1D Mark III and Mark IV, are capable of safety shift by changing the ISO or the aperture. In today’s case, that would have meant ISO 50, which is less than ideal as ISO 50 results in poor signal/noise response. However, in some instances, it is better if the ISO is bumped or lowered instead of the aperture.